The preparation is very exciting for me as I am discovering, studying and learning A Midsummer Night's Dream by Britten. It is fascinating music of great beauty and such intelligence. As I will be staying six weeks, I am also getting to know more about the city and its main attractions and activities. I have heard a lot about the program in the previous years from some friends who have sung as Opera NUOVA. I wanted to have this experience, too, with such great teachers and coaches. With this year's Bejamin Britten opera, it was also very attractive for me as I sing a lot of contemporary music and as it is my favorite musical aesthetic. 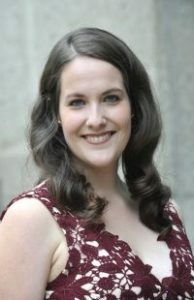 Carole-Anne Roussel is a soprano from Rivière-du-Loup, currently studying at the Conservatoire de musique de Québec under the supervision of Sonia Racine and Martin Dubé. Over the last few years, we have heard her in many roles, such as Annina in The Saint of Bleecker Street by Menotti, Micaela in Carmen by Bizet and Lucy in The Telephone by Menotti with the Conservatoire de musique de Québec, Una Novizia in Suor Angelica by Puccini with the Opéra de Québec, and Laurette in Le Docteur Miracle by Bizet with the Relève Musicale de Québec. She was also a member of the chorus for Verdi’s Requiem in 2014 and Louis Riel by Harry Sommers in 2017 at the Festival d’opéra de Québec. In the last two years, she sang as a soloist in The Bourgeois Gentleman by Lully with the Orchestre symphonique de Québec, in the Paukenmesse by Haydn with the Orchestre symphonique de Lévis, in Mozart’s Requiem with the Chœur des Rhapsodes and with the Orchestre de l’Estuaire. She has also taken part in many singing programs in Canada and in the US, where she received Masterclasses from Marlena Malas, José Van Dam, Sophie Koch, Kathryn LaBouffe, Joseph Rouleau, Richard Margison, Jordi Savall and Sir Simon Keenlyside. For this year’s Opera NUOVA program, she is sponsored by The Conseil des arts et des lettres du Québec.